I love this dress! It sends out so much positive energy, doesn’t it? It’s just so happy-looking. 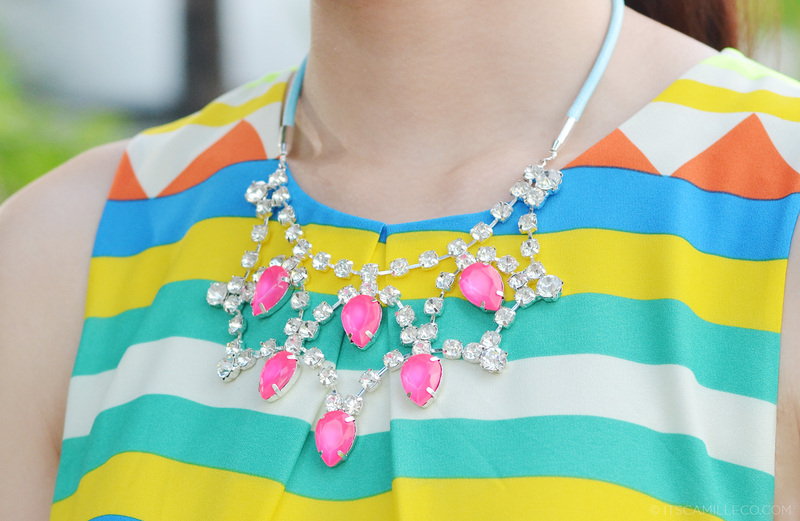 I never thought I’d ever use an emotion to describe a dress…but just look at these colors! It’s not possible to look gloomy and sad in an outfit like this! I wasn’t the only one who fell head over heels in love with this dress. The moment my mom laid eyes on it, I could already see a thought bubble forming in her head. “Must. Steal. This. From. Camille.” My mom loves dresses like this, all the more this one because it’s in a trapeze silhouette. Who can blamed her though? It’s such a forgiving silhouette. All our fats get concealed! No more bulges! Hooray, hooray! More bonus points for this dress because it has pockets too! Who loves pockets? Say “I”!!! Never see you wear such simple garments… But I must say you killed it!!!!! gosh ms. camille. you are overusing that Sergio Rossi heels. haha… its too beautiful naman kasi just like you. you are like a goddess. But they’re beautiful! I have to use them often! Haha! Thanks Izza! Umaangat fair complexion mo Ate Camille. I love visiting your blog because your so accommodating. Ikaw lang ata blogger na kilala ko na individually nagpapasalamat sa bawat comment mo. Oh dear I’ve forgotten again. I really need to start listing down the lippie I use. So sorry! Not so silent anymore I hope! :) Thanks Evellis! It’s like the dress is saying “go away bad vibes!” so refreshing! i wonder how many tons of shoes do you have and how do you maintain them?did you always bring extra flats to avoid callous on your feet?hehe just curious because you maintain perfect feet..
Whoaa! You look so malinis at bumagay talaga sa kaputi.an mo ang dress. You look so young, Miss. And your outfit and accesorries are really matchy-matchy. Not a single piece here is downtoned, Miss Camille. Everything is like a sweetshop color board! I enjoyed the pattern on your dress as well as it’s loose and breezy silhouette. I especially like that photo of you showing off the flowy skirt part. :-D So much cheer in one ensemble! I recognize your shoes from your previous posts. I’m impressed with the effect they had here. I always thought of that color hue as ‘electrifying blue’, but for some reason, it had a sweeter, more blueberry presence when paired with this dress. You noticed my shoes even! :) Wow! Now that you mentioned cupcakes, I’m suddenly craving for one. Danger, danger! Thank you Angelic! So cute!! <3 This outfit made me happy. So bright and full of positive vibes, and maybe because you're wearing a smile too. Perfect, keep smiling Camille. 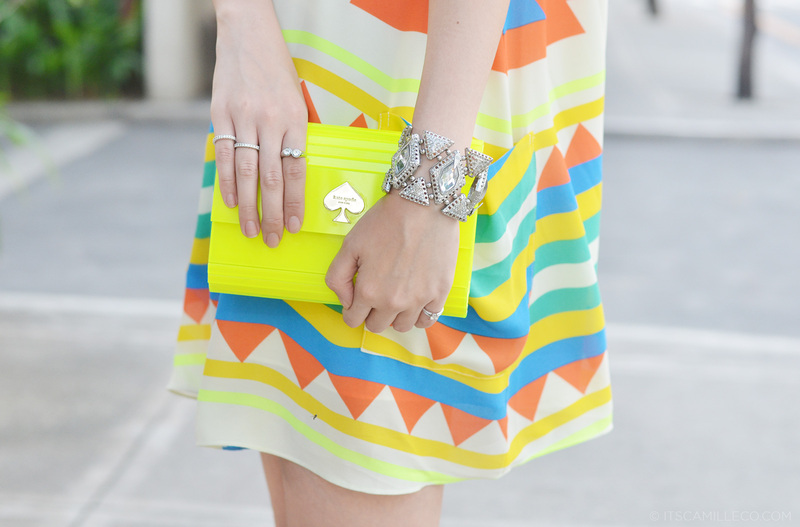 I love the dress, the color and print is refreshing. soooo freshh and bright, you Ms. Happy!!! This dress is so sweet! I’d wear it in an instant. No wonder your mum wants to steal it from you HAHA! such a bright & happy looking dress.. makes you wanna smile..
Will you please do a closet tour for us? Please? I love your dress and I love you! Everything you wear looks good and fab on you… Kahit yata pasuotin ka ng dress na sako magmumukhang elegante sa’yo Ms. Cams.. hehe..
Hindi naman but thank you Steph! This dress is such a breath of fresh air. As you said, you cannot be sad when you’re wearing this dress. It just puts a big fat smile on face. Beautiful and Refreshing. Thanks Naaj! :) I tried pouting but it just doesn’t work with this dress haha! I love this outfit! I agree it looks so happy and bright! Ewan ko na lang pag nabangga ka pa in a public place sa suot mong yan. haha! Kahit pitch black pa, for sure di kailangan ng night vision para makita ka. I love how your dress is not too short and how presko it looks like! Definitely something not advisable to wear on a movie date kung ayaw mong mag-freeze to death! haha! Camille have you seen na Zara’s fall 2013 collection? Everything’s so nice! Here’s their campaign oh: http://www.fashionsquad.com/en/zara-fall-2013-campaign/#more-26343 You have to get those skirts and structured jackets! LOOOVE them! Soooo love Zara. It’s like the middle ground between high street brands and luxury designer brands! I just can’t consider it to be a high street brand! It’s too nice for high street! It looks like a designer brand but priced almost like high streets. o c’mon, you don’t have fats! haha. There are a few!! I’m sure! I love this dress has outstanding color and accessories are beautiful. this is so colorful i love it! you look like an angel (yung fashionista) HAHAHHA. omg! i’m in love with the dress.. do we call this a shift dress as well?